The Global Digital Infrastructure Alliance is a group of highly qualified enterprise technology and IT pro- fessionals who work in leading companies of select industries. The Global Digital Infrastructure Alliance regularly surveys its members on a range of business and IT topics, and converts the information into proprietary quantitative and qualitative reports. 451 Research, a division of The 451 Group, is a leading global analyst and data company focused on the business of enterprise IT innovation. Clients of 451 Research - at end-user, service-provider, vendor, and investor organizations - rely on 451 Research's insight through a range of syndicated research and advisory services to support both strategic and tactical decision-making. 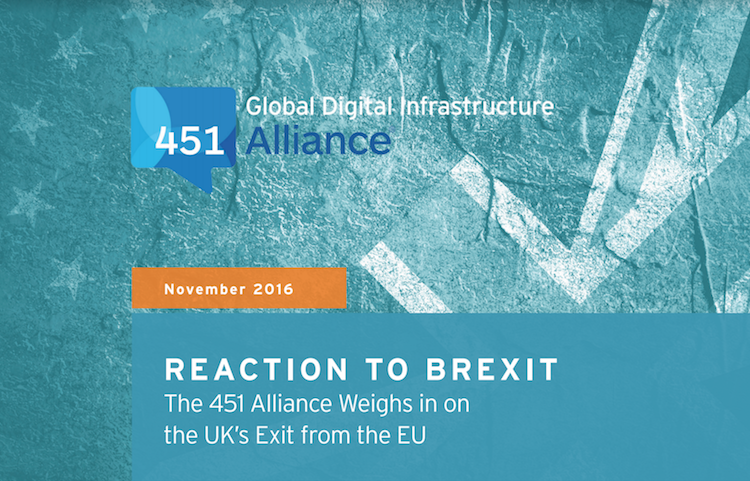 A July 451 Alliance survey looked at reactions to the United Kingdom (UK) referendum to exit the European Union (EU), including its impact on organizations' business, decision-making and outsourcing plans. On June 23, 2016, the United Kingdom held a referendum vote to decide if it should remain in the European Union or begin the process of exiting. Over 30 million citizens cast their ballots, and the results were close - 52% voted to leave and 48% to stay. Shortly after the referendum was passed, the 451 Alliance surveyed IT professionals to determine how this decision might impact business and IT spending plans. - A strong majority of respondents (83%) expect the Brexit vote to have a negative business impact on the EU; only 17% see it having a positive impact. - So far the vote is having little effect on IT spending decisions - 60% of respondents say there is No Change in spending plans and 33% believe it's Too Early to Say. - However, 78% of European respondents (not in the UK) say they are now less likely to outsource their IT infrastructure to a UK-based service provider. In a recent 451 Research report, Andrew Lawrence, Research Vice President for Datacenter Technologies (DCT) & Eco-Efficient IT, noted that, "While the UK accounts for only about 4% of global GDP, it does impact a far greater proportion of the worldwide technology industry. According to the TechNation Report 2016, there are 1.56 million people employed by 'digital companies' in the UK." 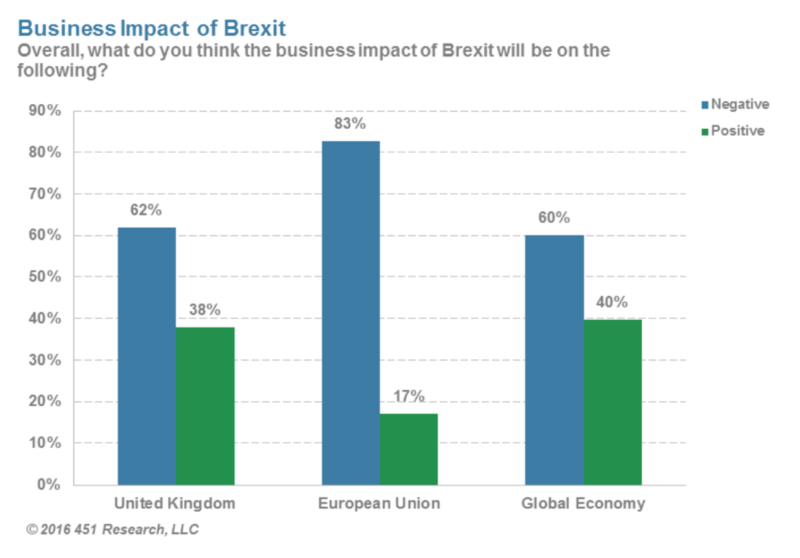 We asked respondents what they think the business impact of Brexit will be on the UK, the EU and the Global Economy - 83% see the brunt of the impact falling on the EU. The negative business impact on the UK (62%) and the Global Economy (60%) - while significant - is still expected to be less than on the EU. Only 17% see Brexit as having a positive business impact for the EU, while 40% see it as a positive for the Global Economy and 38% for the UK. A closer look at the business impact by region further reinforces the strong geographic divide between UK respondents and other European countries. Impact on the European Union. 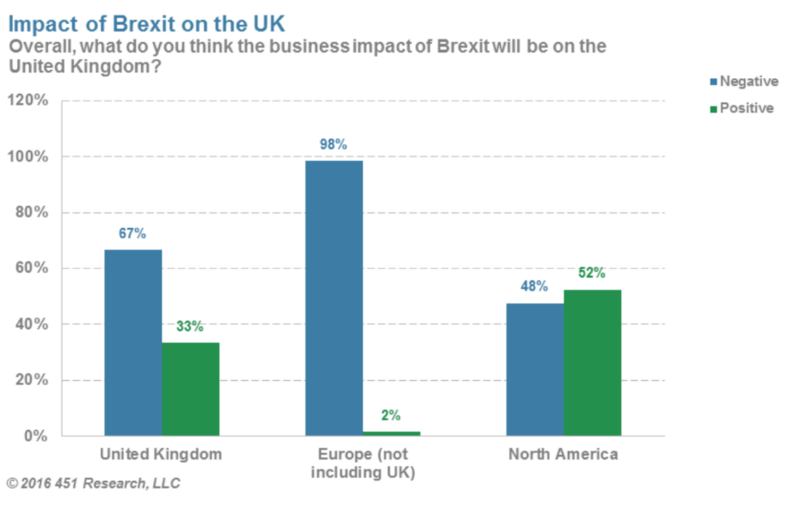 A large majority of respondents from the UK (90%) and North America (83%) see Brexit as having a negative business impact on the EU, along with three-quarters (75%) of respondents from Europe (not including the UK). Only 10% of UK respondents see the business impact as positive for the EU, as do 17% from North America. One-quarter (25%) of European respondents (not in the UK) are optimistic that Brexit will have a positive impact. Impact on the United Kingdom. 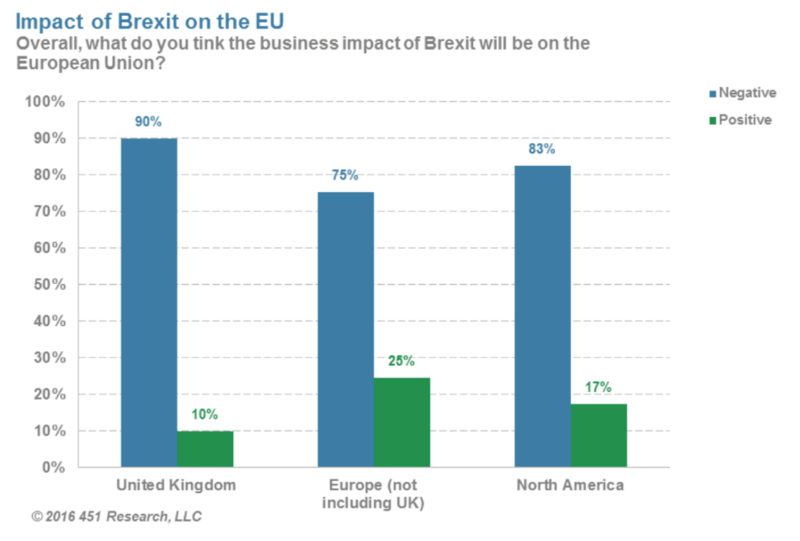 While 67% of UK respondents see Brexit as having a negative business impact on the United Kingdom, 98% of European respondents (not from the UK) see this decision as negative. The North American reaction is more evenly split, with 48% viewing it as negative and 52% as positive. Impact on the Global Economy. 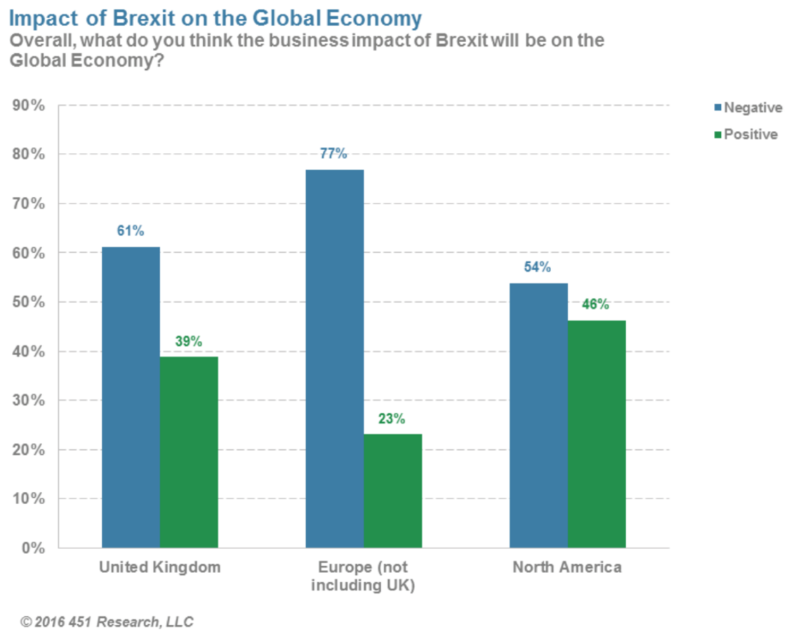 We asked respondents what they think the business impact of Brexit will be on global economy - 77% of European respondents (not in the UK) say it will have a negative impact, as do 61% from the UK and 54% from North America. In contrast, while 46% of respondents from North American and 39% from the UK see the impact as positive, only 23% of European respondents (not in the UK) view it positively. 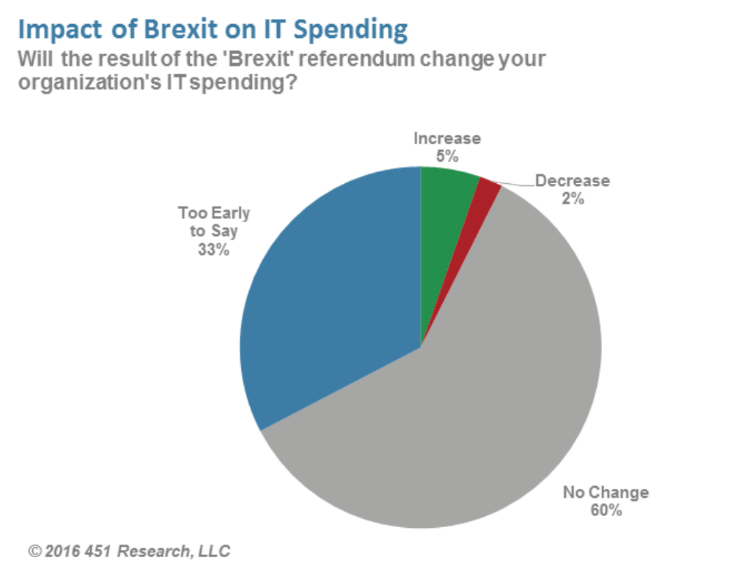 We asked respondents if they think Brexit will impact their organizations' IT spending - 60% say it will not change their spending plans. Another 33% believe it's Too Early to Say. Just 5% say it will cause a spending increase, and 2% say decrease. Some analysts think the Brexit vote could lead to data sovereignty issues for organizations with IT infrastructure in the UK, while others predict it will not be a problem. To find out, we asked respondents if Brexit makes them more likely or less likely to outsource IT infrastructure to UK-based service providers. Predictably, European respondents (not in the UK) had a strong reaction, with 78% saying they are less likely to use a UK based service provider. In contrast, only 28% of North American respondents, and even fewer UK respondents (14%), say they are less likely to do so. Only 18% of UK and 15% of North American respondents say Brexit makes it more likely they will use a UK-based service provider. The majority of UK (69%) and North American (59%) respondents expect their use to remain the same.